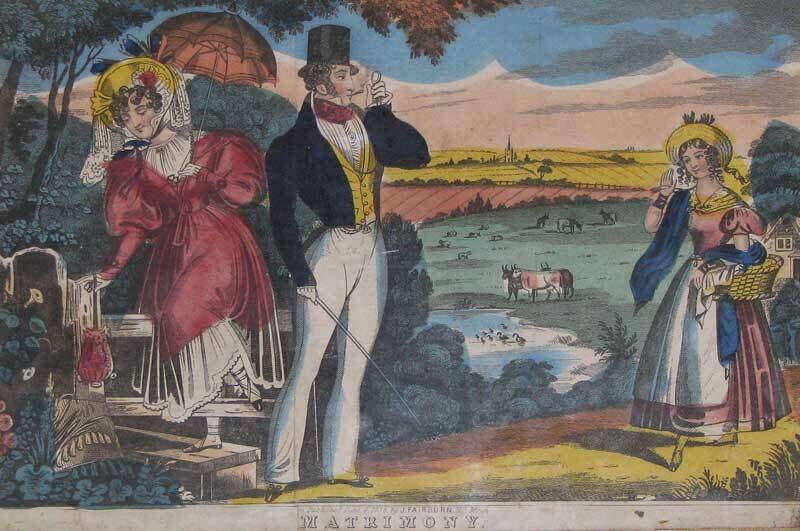 A charming albeit portentous scene with original hand colour; lithographed by Minories after Fairburn and published in London in 1838. In this picture (a possible companion piece to 'Courtship') we see a husband and wife engaged in a strenuous afternoon walk across idyllic pasture. While the wife struggles to get herself and her very full skirts across the style the husband's eye has been caught by a comely village wench wending her way up from the village with something tasty in her basket. The rascal of a husband has the brass front to take a peek at the lass through his eye glass whilst puffing away on his cigarette and flicking the end of his stick.